Judith’s mom, Anita, lived a rich and full life until her passing at the age of 94. Anita knew exactly what she wanted and did not want for care. 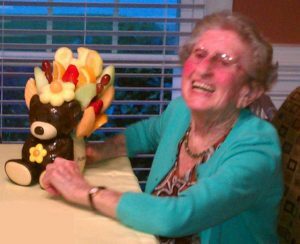 Her wishes were communicated and documented well ahead of any hospice or end-of-life home care needs. Despite all the preparation work, nothing could have prepared Judith and Anita for their journey. By sharing their experiences, the hope is that it will make the inevitable journey more peaceful when the time comes. Confronting the end-of-life discussion is an emotional topic charged with cultural, social and faith-based connotations and expectations, personal biases, and fears. There are many challenges not just for the loved one, but also for the family and significant others. Everyone has a set of expectations and often they are different from those involved in the care process. For those dealing with chronic illness, Home Hospice Navigation: The Caregiver's Guide is a valuable resource. The book is filled with tips that can help address advanced care planning and caregiving approach before a crisis or major change in condition occurs. Knowing your loved one’s wishes and being able to honor them will help guide your caregiving journey. Selecting hospice services is a difficult decision. It is an explicit acknowledgment that a loved one’s life has fundamentally changed. Most of us have never traveled this path. As with most new experiences, we tend to learn by trial and error. The home hospice experience can be very supportive for everyone involved, and this book, Home Hospice Navigation: The Caregiver's Guide, aims to help you navigate the unknowns before issues and concerns become problems. 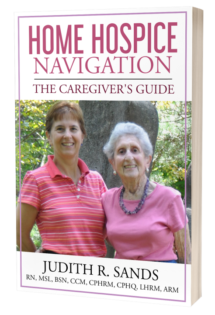 Don't delay, order your copy of Home Hospice Navigation: The Caregiver's Guide today!